The renegade harness has been around for a few years. 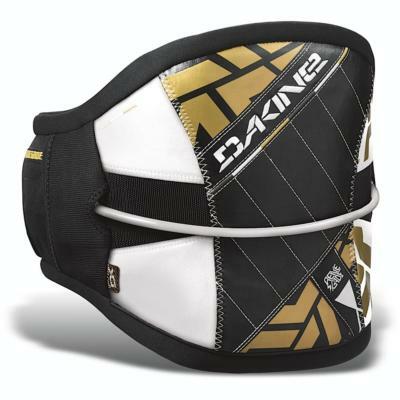 It shares a lot of features with Dakines premium harness - the Pyro, yet the main outer shell is of a generally softer and more flexible combination of materials. It comes complete with everything you need - a spreader bar, pad, dual bladed hook knife and rear handle pass tubing. It has a nice simple attachment system - an elasticated belt with 2 overlapped velcro fastenings, ontop of which the spreader bar attaches via a buckle system. The tightness and height of the spreader bar can be adjusted via two webbing straps on each side, and can also be loosened to assist with getting it on and off. 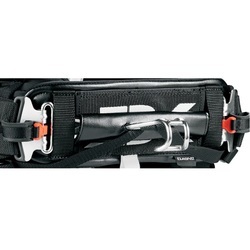 There is also a tie down strap and spreader bar pad to prevent the harness hook from causing injury on heavy wipeouts. It also comes with an easily accessible hook knife situated in the bar pad for use in emergencies. The Renegade isfeels a nice comfortable fit and I had no issues with it on even prolonged sessions. The soft edges mean it doesn't have any problems digging in and causing discomfort. It's also a very lightweight affair and can optionally be used with the sliding spreader kit for surf or for making toeside and blind riding a piece of cake. If you're after a lightweight, fully featured waist harness with all the trimmings, you won't go far wrong with the Dakine Renegade.